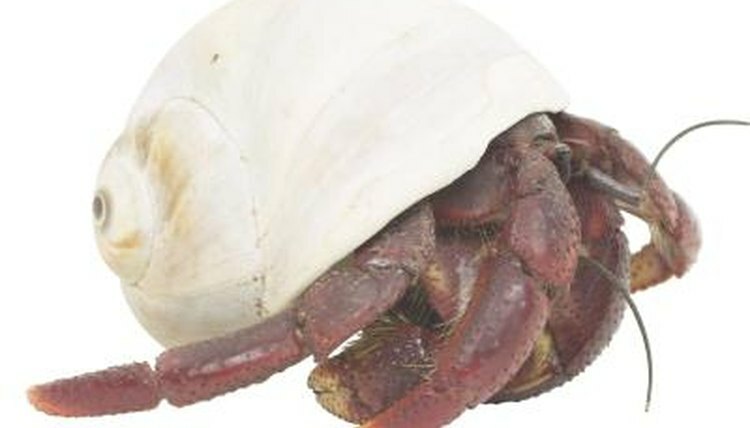 Land hermit crabs are popular low-maintenance pets. They have some care requirements, though. One of their chief housing needs is proper bedding. However, you must provide the correct bedding, in the correct amount and care for it properly for your crab to thrive. Land hermit crabs need bedding for several reasons. First, in the wild, being able to burrow protects them from predators and rival hermit crabs. In captivity, even though they are safe from predators, they need this "security blanket" to keep them from feeling stressed. Additionally, hermit crabs tend to bury themselves to sleep, and they bury themselves for protection during and after they molt. Also, substrate helps keep a tank humid and crab-friendly. Hermit crabs need a humid environment to breathe. Several types of substrate exist. You can usually get hermit-crab-suitable sand in pet shops or online. However, the dirty little secret is that "play sand" sold at hardware stores is cheaper and just as good. Coconut fibers are another popular substrate, which has great antifungal properties. You can also use a mixture of coconut fibers and sand. For most hermit crabs, 3 to 4 inches of sand should be enough. But a specific dimension isn't the point. It's important that your crab have enough room to completely bury himself. You should base the amount of substrate on the size of your crab. Just make sure your crab has enough room to bury himself and his shell, with a bit left over -- actually, left under. You do have to take care of the substrate a bit. Hermit crab care writer Kelli Wilkins recommends you mix water with your sand or sand mixture to achieve a sand castle consistency. If you use coconut fibers, make sure they come from a pet shop so you know they are pesticide-free. If you go the play sand route, be sure and thoroughly rinse it before using it. If you have a problem with mites or mold, you should either throw out your substrate or sterilize it by baking it at 300 degrees Fahrenheit for half an hour while you treat your crabs.